I am embarrassed to say that I am a (seasoned?) IT professional who has never quite found the time to get down and dirty with Cisco networking. As I am about to start a new role as a Solution Architect for a managed service company (who are big into their Cisco gear, MPLS etc), I thought now would be the time to bone up on my 1s and 0s and certify in the Cisco space! 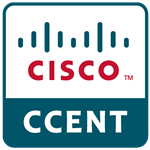 I can imagine that for someone new to IT, the CCENT / CCNA would perhaps be quite daunting, but even having worked with MS, VMware and storage environments for the past 9 years, I discovered that I still had plenty to learn (and in a geeky way, quite enjoyably so!). I did add to my burden by simultaneously going through interviews, completing handovers at my old job, and generally being ridiculously busy whilst trying to find the time to study for this, but even with all that on the go I passed the first exam (640-822) less than 6 weeks from beginning to study the subject. Based on this I would suggest that anyone dedicated to complete the CCENT could comfortably learn the content in full, pass it in 4 weeks of part-time personal study (in my case a couple of hours a night on the nights I had time to work). I would also say at this point that for those people considering whether to do the ICND1/2 (2 exam) route, or the single CCNA exam, I don’t really know why virtually anyone would consider the latter? The combined exam costs twice as much as the single exam (give or take £2-3), and splitting the exam gives you an initial qualification (CCENT) and an easier ride. Unless you are so time poor that you can only afford enough time to do a single exam (saving you a whole 2 hours of your life), why not take the pressure off yourself and split it? Also if you did happen to mess it up, then you’ve only lost £100, not £200! The exam itself was not too bad. One question I came across seemed to be bugged, (the responses in the sim to certain commands were conflicting), but other than that it was perfectly reasonable. Bear in mind that the pass mark for Cisco exams is considerably higher than MS / VMware ones, so if you are used to these, ensure you adjust your expectations accordingly. It is also slightly disconcerting not to be able to go back to a previous question; not that I regularly use this feature in other exams, but its always nice to know it’s there if you need it! In terms of the actual resources I used to study for the exam, they were numerically limited in comparison to those I may use for a VMware or an MS exam, (and more expensive as I generally stick to free resources! ), but I felt that to gain the knowledge in the quickest time, it was worth a the meagre financial investment I made (~£45 for training materials, ~£45 for my lab, plus the exam cost – normally covered by my employer, but I was working out my notice period at the time, so even attempting to claim for exams whilst walking out the door isn’t exactly ethical and might get me a slap from my old boss!). I’ll say off the bat this is a simply great resource, taught in Chris’ inimitable laid back, easy style. Hey not only teaches you how to pass the exam, but gives plenty of real world advice and anicdotes too. He is also more than happy to answer any questions and does so promptly via twitter, email, Udemy etc. 90% of my learning came from these videos, along with the brilliant binary / subnetting practice questions provided as part of the accompanying ebook.I found that the best way to use the videos was to watch them whilst taking copious notes, then practicing every command and activity discussed using my GNS3 lab. The more you practice this, the better it will stick. I enjoy Chris’ style and have such confidence in his teaching, I have already pre-purchased his CCNA:Security and CCNP courses on Udemy, for which I am hoping to squeeze some time in next year. In my case I used this book to supplement / consolidate my video learning, and read the book after completing the video course. It is very well written, and any subjects not fully explained in Chris Bryant’s course are covered in detail here. There are also useful tests at the start of each section to help you guage your progress.You also have the option of buying the same book split into the two exams (ICND1 and ICND2) but the cost of the combined publication works out at half of that of buying the seperately, so why would you?One thing I always mention when it comes to tech books, is that unless you have a need to fill the shelves of your home office with dead trees, I would always recommend opting for the ebook version over the hard/softback. There are several reasons for this, but the two biggest are that the ebook is cheaper (we all like saving money, right? ), and what is the point in killing a few trees for a book you will probably only read once or twice, and will be out of date within a couple of years anyway? Add to that the portability of ebooks for later reference and you have a compelling argument… the only draw back is putting money in the pocket of a company who is not particularly great at paying taxes, but other vendors are available! Not only is this great geeky fun, but it will hone your brain to very quickly do binary maths without the use of big tables etc, saving valuable time in your exams, and in your actual job. Chris Bryant does a great job in his course of teaching you the simplest and “correct” way of doing binary. Once you have this down and practiced with the binary game, you will easily be able to do binary conversions and subnetting etc in your head (especially when you start to see the patterns used to create subnets etc). For me, this is an absolutely MUST HAVE resource, both for your studying, but also in your day job, where you can safely test any new configurations or commands to ensure you dont break your production environment! In essence it is a Cisco (other vendors are available) simulator, which allows you to build virtual networks using actual Cisco IOS images, and mess with them to your heart’s content. CBT nuggets kindly did a free intro video to GNS3 (link below).Getting hold of the IOS images is also very easy. I would simply say google is your friend (especially when searching for exact IOS image names). To understand how the IOS naming works, see this great little article.Once you have your lab up and running, all I can say is practice, practice, practice! Throughout every video session I had my lab running in parallel, and implemented each command several times on several machines, to really ingrain the commands and knowledge. The only drawback of GNS3 is its inability to simulate / emulate the ASICs in Cisco switches. For this they simply give you a fake switch you config from the GUI. If you want to be able to practice switch configuration to a greater level, I recommend getting your hands on a cheap second hand switch. I bought a 24-port Catalyst 2950 switch for just £30 on ebay, and a rollover cable and USB adapter for about £5. This gave me the ability to practice switchport and VLAN commands, have a physical play with the kit, and even link my physical switch into my GNS3 environment using the NIC on my GNS3 host machine! The only drawback is that it’s very loud, so I try to minimise the use of it in my home office! I can imagine the WAF (wife acceptance factor) of a full blown lab would not be great, an even better reason for using GNS3 wherever possible! Intro to GNS3 by CBT Nuggets – free! Great little one hour course showing you how to setup a basic GNS3 environment. They also have a much longer course which you can pay $5 for a month access, but it isn’t necessary for a simple setup. There are plenty of free videos, pdfs, presentations and even whole lab sims available on the ICND1 page. I would suggest you go through all of them. Make sure you are able to complete all of these successfully before attempting the actual exam. In closing, I think the key thing to remember when learning Cisco is lab, lab and more lab… GNS3 is a great resource and more than sufficient for your CCENT (and I would hazard your CCNA) studies. If you have the budget to buy a cheap switch as well (e.g. a 2950) then all the better. Next steps: New job, Xmas, then CCNA in Jan.